Life After Genius by M. Ann Jacoby!!! How do you enter? It's easy here at The Sweet Bookshelf, just leave a comment with your email address! Don't have a blog to comment? Just email me that you would like to be entered. This giveaway is available to US and Canadian Residents only. I PROMISE I've got some International contests coming soon! Theodore Mead Fegley has always been the smartest person he knows. By age 12, he was in high school, and by 15 he was attending a top-ranking university. And now, at the tender age of 18, he's on the verge of proving the Riemann Hypothesis, a mathematical equation that has mystified academics for almost 150 years. But only days before graduation, Mead suddenly packs his bags and flees home to rural Illinois. What has caused him to flee remains a mystery to all but Mead and a classmate whose quest for success has turned into a dangerous obession. At home, Mead finds little solace. His past ghosts haunt him; his parents don't understand the agony his genius has caused him, nor his desire to be a normal kid, and his dreams seem crushed forever. He embarks on a new life's journey -- learning the family business of selling furniture and embalming the dead--that disappoints and surprises all who knew him as "the young Fegley genius." 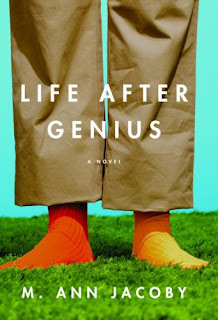 Equal parts academic thriller and poignant coming-of-age story, LIFE AFTER GENIUS follows the remarkable journey of a young man who must discover that the heart may know what the head hasn't yet learned. That sounds like a really good book, I am going to have to add it to my list! I would love the chance to win it, [email protected], I am a follower! This book caught my eye quite some time ago so I would love a chance to read it. I've added your contest to my sidebar here. The books sounds really interesting. Please enter me! This reminded me of Flowers for Algernon. Some day I want to read about a happy genius. Thanks for the contest. This sounds like a great book. +1 Posted this on my blog. I've added the contest to my blog. Mary thank you -this sounds interesting. This sounds like an interesting read. Count me in. +1 it's in my sidebar!